SM Gift Passes w/ Visa Credit ~ Philippine Freebies, Promos, Contests and MORE! Get a chance to win SM gift passes with your Visa Credit Card everytime you make a single-receipt purchase worth P3,000 at any The SM Store. Upon transaction, your receipt will display a message if you win or not. If you did get a good news, head on at the Customer Service Counter A (BCO) of The SM Store where the transaction was made and present the winning transaction receipt, charge slip and the VISA Card used. The claim stub should also be surrendered upon verification of the winning transaction. Everyday, ten (10) shopping spree winners will each receive P5,000 SM Gift Passes which you can use at The SM Store. Start swiping and expect a shopping splurge in return. Congratulations! 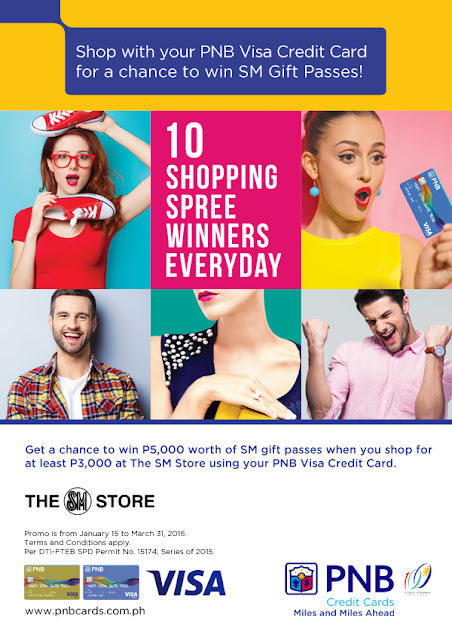 You Won P5,000 Shopping Spree at The SM Store! Please present receipt to the Customer Service Counter to claim. Enjoy shopping at The SM Store with your VISA card for a chance to win a Shopping Spree! Note: If you can't claim your prize on the same day due to an emergency or for whatever personal reason, it will be handled on a branch to branch, case to case basis. Customer Service may list down details to accommodate you the next day or next week. For representatives, they must have authorization letter and 2 valid IDs of the winner plus another 2 valid IDs of her/his own.